Since August, the Tamil Nadu Police have been summoning between 10 to 15 persons every day to Thoothukudi’s South police station, to check on the spread of social media messages against the Vedanta Group’s Sterlite copper smelting plant. It has been reported that the police have been serving notices to the suspected protesters who participated in the anti-sterlite agitation demanding the permanent shutdown of the controversial plant, perhaps to stifle any future protests against the plant, amid serious attempts by the Vedanta to reopen the plant. Currently, the National Green Tribunal has appointed a committee to enquire and decide on the reopening of the controversial plant. In August, the Madras High Court had ordered the Central Bureau of Investigation (CBI) to probe into the May 22 violence and the police firing. Following the court order, the state police started serving summon notices to people, a separate exercise, which, the activists and lawyers are arguing, is “illegal”. “At least 10 to 15 people suspected to be sharing instigating messages are questioned every day. We try to find the origin of the message as part of our preventive measures,” Murali Rambha, the Thoothukudi Superintendent of Police was quoted as saying. 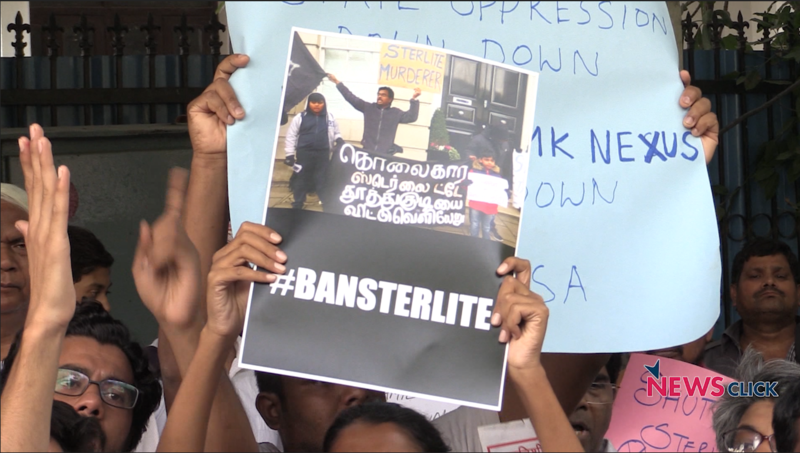 According to the Scroll.in, police authorities had prepared summons under Section 107 for nearly 300 people, who participated in the anti-Sterlite protests. As per this section, the executive magistrate can detain people for up to a year if they are believed to be a threat to peace and public order. “While investigating the WhatsApp messages, it is found that you have shared and received illegal content. Hence, you will have to come in person to the police station for enquiry,” was stated in one of the notices. Police have been serving notices through phone calls and written summons and asking the suspected “instigators of violence”. Reportedly, the summoned people’s social media accounts are being scrutinised, and they are being asked to submit in written that they would not share any anti-Sterlite messages. Lawyers and activists are saying that this police action is illegal. Henri Tiphagne of People’s Watch said that there is no provision in the Criminal Procedure Code (CrPC) or the Tamil Nadu police standing orders which can be applied to summon an individual for checking WhatsApp messages. “They can call for witness for inquiry under 160 CrPC, summon a person to produce documents under Section 91 or under Section 41A when reasonable suspicion exists that he has committed a cognisable offence, but when the arrest of that person is not required,” he said. Residents of villages surrounding the copper plant have led peaceful protests from February this year against the Vedanta group’s attempts to expand the plant. On the 100th day of their agitation, May 22, thousands of them marched to the district collectorate demanding the complete closure of the plant. During the March, the police forces resorted to firing in which 13 people died, and dozens were injured severely. Following this, while the state government ordered the shutdown of the plant, the police have registered multiple cases against the protesters. The role of police in May 22 violence has been seriously questioned by numerous independent bodies. According to the People’s Inquest report into the Thoothukudi firing, “the police used excess force in many separate places and at many different times against the marchers often without provocation. Eye-witness accounts strongly suggest police violence was not with the intention of dispersing the crowd but intended to intimidate, hurt and cause panic”. According to S Jimraj Milton, secretary of People’s Right Protection Centre, Chennai, who is also part of a team of lawyers providing legal aid to the accused, the police have booked nearly 200 people, and more than 20 of them were named in multiple cases in relation to May 22 protest. Reportedly, one M. Rajkumar, a hospital worker, was booked in 133 cases, mostly related to public property destruction and Fatima Babu, 65, who has been raising environmental concerns due to the Sterlite plant for more than 20 years now, was booked in at least six cases. Thoothukudi, called Tuticorin in colonial times, is a small but important port-city and industrial centre in southern Tamil Nadu.